Songs for Bronnie | News and Features | Style Weekly - Richmond, VA local news, arts, and events. A former singer becomes a model of courage after a Lou Gehrig’s disease diagnosis. Scott Elmquist Browen Zwicker, a Trinity High School and James Madison University graduate, poses for a photo at her parents’ home. Some of her musical friends are throwing a benefit concert for her on Saturday, Dec. 15, at Hardywood Park Craft Brewery. Sitting in the living room of the Zwicker household off Huguenot Road, playing one of the world's shortest games of fetch with a feisty Chihuahua mix named Ziggy, I'm having flashbacks to waiting on a high school date. 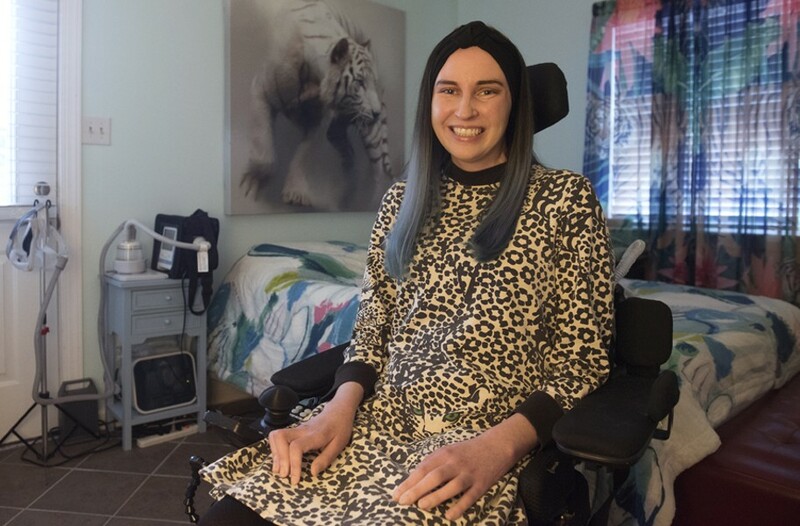 The person I'm here to meet, 36-year-old Bronwen Zwicker, is preparing with the help of two friends in a closed adjoining room, while her parents, Bob and Dianne, whom I just met, move silently in the kitchen. The family's home is cozy and filled with musical instruments —acoustic guitars, an old upright piano across the hall. But this isn't that kind of date. And Zwicker is running late because everything she does now takes more time, even breathing. She lives here with her husband, Stephen Martineau, who is telling me about navigating complex insurance mazes while helping his wife deal with the traumatic journey that is amyotrophic lateral sclerosis, known as ALS or Lou Gehrig's disease. The rare and progressive neurological disease involves the deterioration of motor neurons, with the brain systematically losing its ability to control the body's muscles, including those responsible for moving, speaking, eating and breathing. It's a relentless and cruel disease: Life expectancy is two to five years from diagnosis. "Doctors told me it's one of the most expensive diseases. You need to figure out how fast it is, so you can try to plan things out," Martineau says. "To me, the biggest problem is that nobody really offers you information. You have to know the language, become a doctor yourself, to know you should be having this done at this point." Luckily for Zwicker, a graduate of Trinity Episcopal School and James Madison University, she still has a loving family and many friends who are pulling together to help. They're holding a benefit concert at Hardywood Park Craft Brewery on Saturday, Dec. 15, featuring her friend, Meg Remy of U.S. Girls —just named the best live act in America by Paste Magazine —as well as Dorthia Cotrell of Windhand, Gull and New Boss. Zwicker, a talented singer from a musical family, will be attending by way of a motorized chair with an attached breathing machine. A few years ago, ALS got a bump in public recognition thanks to the viral ice water bucket challenge, but it's still not as well-funded or understood as other diseases. Every day an average of 15 people are diagnosed, more than 5,600 each year. A comparatively lucky 5 to 10 percent get a familial or genetic version, which moves much more slowly. But this is not Zwicker's kind, she found out. Martineau explains that no two people with ALS are the same, each starts at a different place and progresses at a different rate. In his search for information, Team Gleason, a nonprofit foundation started by New Orleans Saints football player Steve Gleason, has been one of the best and quickest groups to help them, he says. And for this couple, prioritizing time is everything. When the two doors finally slide open, Bronwen Zwicker motor rolls into the room looking far too radiantly beautiful for what she's had to endure. When she speaks her voice is a little frail, slow and weak, her lung capacity diminished. Each of her words seems to require a focused effort. And even though swallowing is difficult, she's still smiling — her eyes are still bright. It's the kind of thing that makes you feel bad for ever complaining about anything. We start out talking about happier times, when she was still belting out songs at the piano. "Yeah, I was a pretty good singer, it came naturally. Not any more," she says with a faint laugh, before acknowledging, for the first of many times, how grateful she is for friends and family, including her sister, Vicki, and friend Kassie Richardson, who is on tour singing with U.S. Girls. Richardson met Bronwen at JMU, but says she really fell in love with the entire Zwicker family and their established tradition of back porch music playing. "Being able to spend time, to transition into adulthood, really, with the Zwickers, helped me find my voice," Richardson says. "If you go to the Zwickers' house, you will be handed a guitar, and you will be expected to share a song." Bronwen's symptoms were first noticed in July 2017, while she was helping her father move a mattress and two fingers on her left hand seized up. "I shouldn't have dropped that," her husband recalls her saying at the time. A few months later, the couple brought home Ziggy, their little rescue dog who can fetch all day. During walks together, Zwicker began to occasionally stumble and sometimes collapse. A year ago, she was diagnosed with ALS and already, in that short span of time, the disease has left her unable to do much on her own. Asked what inspires her to keep going, Zwicker's words slow down even more and take on an emotional weight that is almost unbearable. So many people, she says. Bronwen Zwicker speaks about the people who have inspired her as she deals with ALS. "Of course, my sister always letting me know that, whatever feelings or thoughts, are always acceptable," she says, crying softly through the words. "And my husband for always reminding me that I'm still here. Because it's easy to feel like a different person. He always helps to reinforce that I'm still me. But it is hard to remember what life was like before such a trauma." In hindsight, if she could go back to first being diagnosed, she says, "What I would've done is walk more." By now, everyone in the room is ready to cry, but Zwicker stays upbeat. "I think despite the circumstances I'm still happy, which is weird," she says, giving credit to friends and family again. "It's not too long from now that I'll probably require 24-hour care, which insurance doesn't pay for and nobody can afford." Sitting directly across from Zwicker is her mother, who is unable to speak due to a stroke. Throughout the interview, her kind eyes remain locked on her daughter, never once looking away. She clearly understands. "I've always been a person who evolves. I'm open to change," Zwicker continues. "So what I've been working on for my diagnosis is spending as much time with my mother as I could. That led me to thinking about the importance of listening. Being present. And after the diagnosis, realizing there would come a point when I'd be doing a whole lot more listening — like mom." Currently Zwicker is on two medicines: One is 20 years old, while the newest one, Radicava (edaravone), has been found to slow the disease by a third in some cases. She stopped an experimental treatment at Johns Hopkins University a few months ago after it proved too difficult to continue, her husband says. Initially covered under the Affordable Care Act, after getting married she switched to her husband's insurance through his job at the Department of Motor Vehicles. Now she's on Medicare and his insurance pays for various machines, but not for caregivers like Eliza Childress, who comes to the house to assist her. Childress had never worked as a caregiver, but says she now can't imagine her life not having met Bronwen. "Her positivity, sense of humor and her talents are boundless. She has taught me how to love more fully, be present, patient, to be more attentive and understanding of others wants or needs," she says. "To move beyond personal hindrances as life does not adhere to our expectations of how we believe it should be. It's difficult to express how much she has come to mean to me." Friends and family have pulled together to help build a new accessible bathroom addition onto her parents' home. In seven months, they raised online more than $40,000 of a $50,000 GoFundMe goal. But her costs will only continue to increase. That's why this concert is so important, Richardson says. "I could fill a book with the reasons Bronwen is special to me," Richardson says. "But I don't know what people [with ALS] do who don't have friends and family who love them immeasurably or do not have any kind of funding whatsoever." The headliner for the concert, Meg Remy, whose smart and political dance pop with U.S. Girls has been praised by legends such as Iggy Pop, will be delivering a special solo set using tapes. She sent this via email: "I look forward to coming down to Richmond to perform a scrappy, old-school U.S. Girls set in celebration of Bronwen and in protest of the inhumane conditions of the United States health-care quagmire." Zwicker, who says she is not religious, continues to handle the journey of the disease with a dignity and eloquence that's almost breathtaking. "I think I was on a really good trajectory as a person, prior to my diagnosis, growing as a person and becoming increasingly sensitive to people around me. That hasn't changed, but it's taken on a new form," she explains. "How can I put this into words? Another weird change is when people say, "When I'm old, I'm going to do this and that." And I'm thinking, you better do it now." The rest of us can only sit in silence, nodding our heads. Bronniefest 2018 featuring Meg Remy (U.S Girls), Dorthia Cottrell (Windhand), Gull and New Boss takes place on Saturday, Dec. 15, at Hardywood Park Craft Brewery. 5:30 to 10 p.m. Suggested donation of $20. There will be an art auction and raffle prizes. hardywood.com.